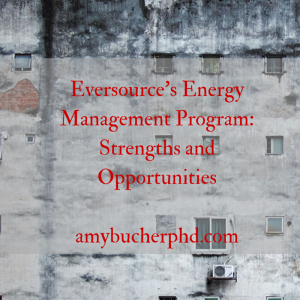 Eversource's Energy Management Program: Strengths and Opportunities | Amy Bucher, Ph.D.
Opower started the trend: Tell people how their energy consumption compares to their neighbors’, and watch them start to conserve electricity in order to move closer to the norm. After Opower showed initial results suggesting that social data can influence utility usage, other approaches to the issue gained momentum. In addition to direct competitors in the energy management space, devices like the Nest thermostat leverage technology to help people save money and power. While I’ve read a lot about these sorts of solutions (and lusted after a smart thermostat of my own), only recently have I been able to experience one firsthand. 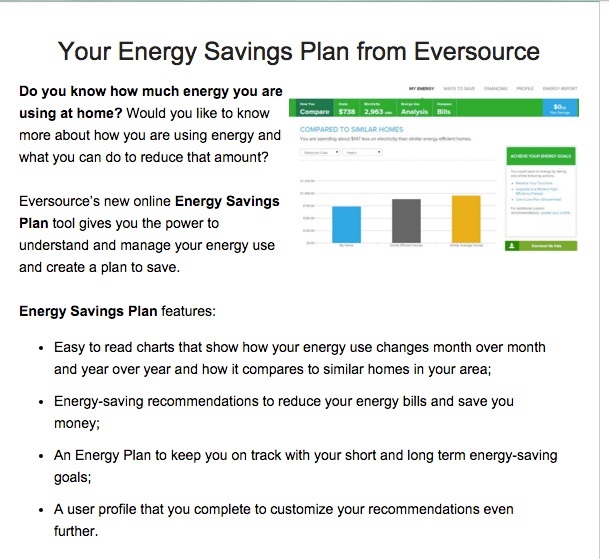 Eversource is my local energy provider, and they just rolled out a program through C3 IoT (formerly C3 Energy) that leverages both social comparison and competence support to try to influence people’s utility usage. Obviously, I had to enroll and check it out after receiving the introductory email. People want to save money. They will care about monitoring energy usage if it helps them to do that. A smaller set of people are also environmentally motivated and will be interested in hearing about how to do good by monitoring energy usage. If the program can help people be more comfortable at home (for example, by more effectively moderating the thermostat in advance of a change in weather so they don’t wake up covered in sweat), that might appeal to some. My verdict: Recruitment needs some work. On to the program itself. First things first: Eversource notes what my energy consumption looks like today. 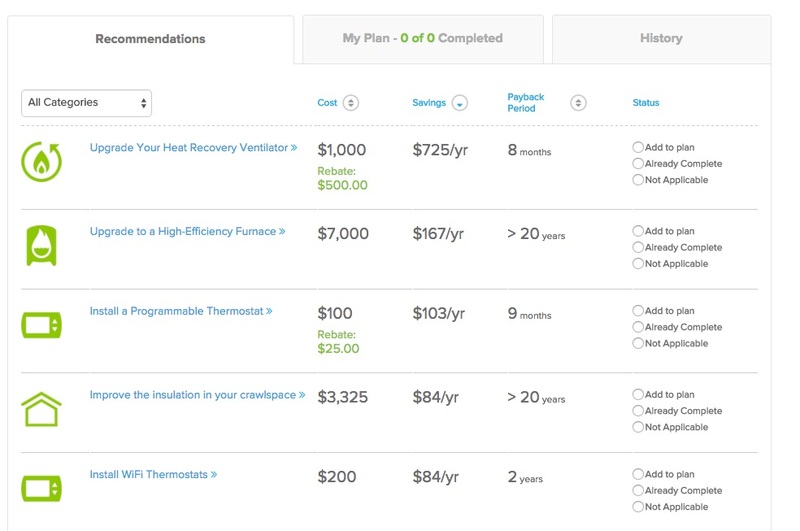 One of the first steps I took when I clicked into the Energy Savings tool was completing a 23 question home profile letting Eversource know what type of building I live in, what type of appliances I use, and where our heat comes from (well, not so much on the last; they didn’t offer “steam radiator” as an option). They seem to have overlaid my answers on my actual energy consumption, using comparison data from the area. 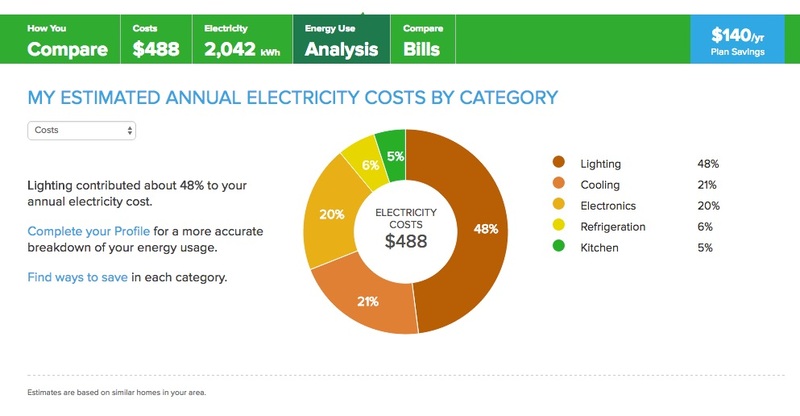 This is useful to me: I can quickly see what types of activities are driving our costs and think about ways to use less electricity. Before I set my goal, the visualization of my savings is empty. However, what is missing from this goal-setting tool is some kind of context to help people set reasonable goals for themselves. You’ll notice that the savings goal is expressed in kilowatt hours. To go back to my earlier point, most consumers care less about energy as a concept and more about energy as a cost. The goal should either be expressed as dollars saved or there should be some easy way to see how kilowatt hours translate into dollars (note that it is NOT happening in the blue square at top where you might expect it). Kilowatt hours by themselves are meaningless to the majority of consumers. On a nitpicky note, I dislike that the tool lets you go up to a 100% savings goal. That’s not realistic. A modern home must use some energy to function. This reminds me of those diet tools that show how much exercise you have to do to burn off the calories in individual food items, implying that we should exercise off everything we eat. We need calories to live, and homes need electricity to run. I live in an apartment, yet have a tip about my crawlspace. I rent, yet am urged to upgrade my furnace. I live in a shared building that’s over 100 years old, but central air conditioning might be a good idea. I was reminded of a post my friend Brad Lowrey, a recent third-time dad, wrote about his experience with marketers for baby products. He notes that he understands why a marketer would assume their audience is a mom, but for those companies who have asked and know he is a dad, persist in calling him mom. He writes, “My frustration is because the marketers at Enfamil are outright ignoring the data they have.” So too, Eversource is ignoring some data I just gave them that could make this experience more personal and relevant for me. There is additional information if you mouse over each bar to help with context. I don’t love this particular data display for motivating reduced energy consumption. My natural response to this is to pat myself on the back for a job well done, not to look for a light to dim or an unnecessary appliance to unplug. What I think could be more effective (albeit certainly more complicated) would be to orient people to the next level of energy efficiency. 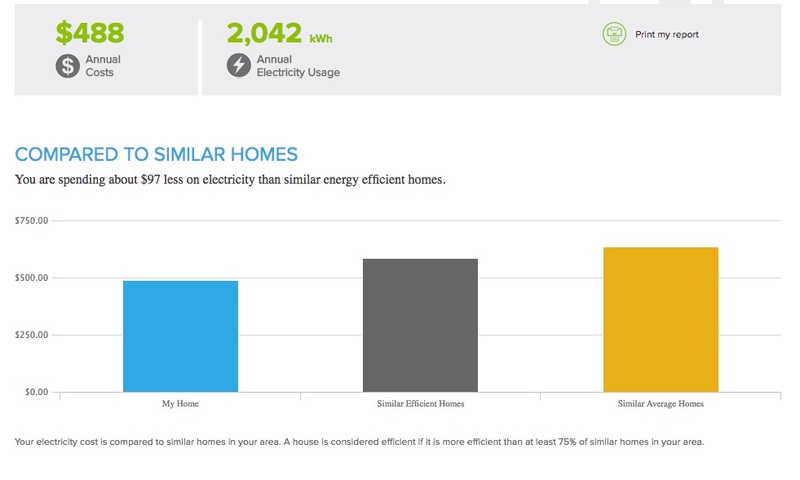 Let’s say I am in the 80th percentile of energy efficiency. Show my data next to the 85th percentile to emphasize that I could do a little better, but not the 100th percentile (you don’t want to depress me). When I mouse over, show me a suggestion that is relatively easy to implement that could move me closer to the 85th percentile. Can I invest in a different type of lightbulb? Buy a new powerstrip? This is an opportunity to nudge my behavior in a positive direction, but the Eversource program doesn’t really take advantage of it. The new Eversource program has potential to improve and drive more meaningful behavior change for consumers. However, I recognize as both a behavior scientist and an Eversource customer that this is a huge leap from where they were before. I’m excited to see how Eversource and C3 IoT grow this initiative over the years to come (and to get some actionable tips on cutting my own electricity costs).